Go to original pattern for design DROPS 200-13. 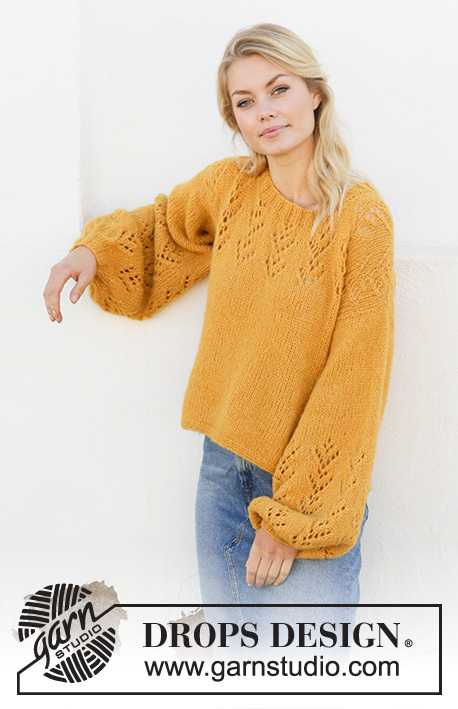 Knitted jumper with balloon sleeves, lace pattern and split in sides. The piece is worked in DROPS Air. Sizes S - XXXL. 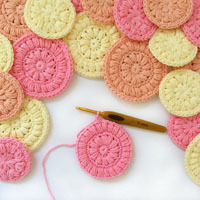 DROPS CIRCULAR NEEDLE SIZE 5.5 MM: length 60 cm or 80 cm for stocking stitch. DROPS CIRCULAR NEEDLE SIZE 4.5 MM: length 40 cm and 80 cm for rib and garter stitch edges. All decreases are worked from the right side and decrease for neck inside the 1 edge stitch in garter stitch towards the neck. 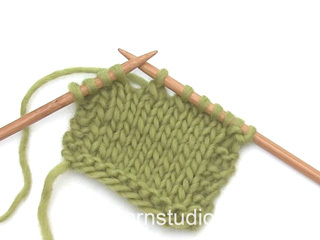 Decrease as follows after 1 edge stitch in garter stitch: Slip 1 stitch as if to knit, knit 1 and pass the slipped stitch over the knitted stitch (= 1 stitch decreased). Decrease as follows before the 1 edge stitch in garter stitch: Work until there are 3 stitches left on row, knit 2 together and finish with 1 edge stitch in garter stitch (= 1 stitch decreased). DECREASE TIP-2 (for decreases in middle of sleeves). When decreasing 3-3-3-4-4-4 stitches evenly, it is neatest if the decreases are divided so that you decrease 1 stitch over each of the middle 3-3-3-4-4-4 repeats of A.1. Decrease 1 stitch by knitting 2 together. Decrease as follows after the1 edge stitch in garter stitch: Slip 1 stitch as if to knit, knit 1 and pass the slipped stitch over the knitted stitch (= 1 stitch decreased). Decrease as follows before the 1 edge stitch in garter stitch: Work until there are 3 stitches left on the row, knit 2 together and finish with 1 edge stitch in garter stitch (= 1 stitch decreased). Work 2 stitches in same stitch by knitting 1 stitch in the front and back loops of same stitch (= 1 stitch increased). To work out how to increase evenly, count the total number of stitches on needle (e.g. 62 stitches), minus edge stitches (e.g. 2 stitches) and divide the remaining stitches by the number of increases to be made (e.g. 17) = 3.5. 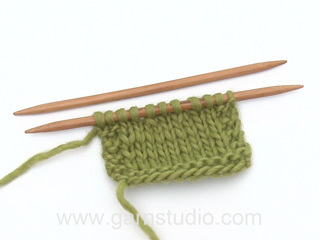 In this example, increase by making 1 yarn over after alternately each 3rd and 4th stitch. On the next row (right side) knit the yarn overs twisted to avoid holes. The whole piece is worked back and forth in sections with circular needle, bottom up. The garment is sewn together and the neck worked in the round to finish. Cast on 81-87-93-102-113-121 stitches with circular needle size 4.5 mm and Air. Work 3 RIDGES – read description above. Change to circular needle size 5.5 mm and work stocking stitch with 3 edge stitches in garter stitch in each side for the split. REMEMBER THE KNITTING TENSION! When the piece measures 10 cm finish the split. Continue with stocking stitch and 1 edge stitch in garter stitch in each side. 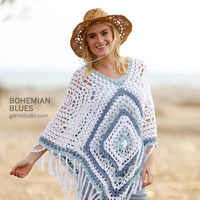 When the piece measures 30-32-34-31-33-35 cm start the lace pattern and the next row is worked as follows from the right side: 1 edge stitch in garter stitch 1-4-7-6-6-10 stitches in stocking stitch, work A.1 until there are 2-5-8-7-7-11 stitches left on row (= 7-7-7-8-9-9 repeats of 11 stitches), work 1-4-7-6-6-10 stitches in stocking stitch and 1 edge stitch in garter stitch. Continue this pattern. AT THE SAME TIME when the piece measures 32-34-35-36-37-38 cm cast off 1-2-4-4-6-6 stitches for the armholes at the beginning of the next 2 rows = 79-83-85-94-101-109 stitches left on needle. Continue the pattern with 1 edge stitch in garter stitch and 0-2-3-2-0-4 stitches in stocking stitch in each side. 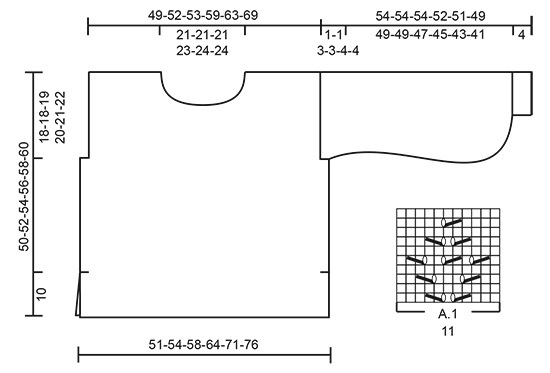 When the piece measures 40-42-43-45-46-48 cm place the middle 25-25-25-28-31-31 stitches on 1 thread for neck = 27-29-30-33-35-39 stitches left on each shoulder. The shoulders are finished separately. Continue the pattern as before. AT THE SAME TIME on the next row from the right side decrease 1 stitch for neck – read DECREASE TIP-1. Decrease like this every 2nd row (i.e. every row from the right side) a total of 4 times = 23-25-26-29-31-35 stitches left – NOTE: The stitches which do not fit into the pattern when decreasing are worked in stocking stitch (applies to XL, XXL and XXXL). Continue the pattern as before until the piece measures approx. 50-52-54-56-58-60 cm. Loosely cast off with knit from the right side. Work the other shoulder in the same way. Cast on 81-87-93-102-113-121 stitches with circular needle size 4.5 mm and Air. Work 3 RIDGES – read description above. Change to circular needle size 5.5 mm. Then work stocking stitch with 3 edge stitches in garter stitch in each side for split. When the piece measures 10 cm finish the split. 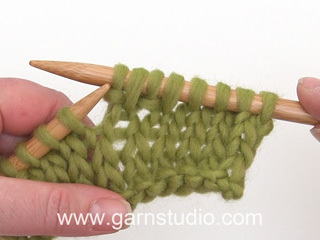 Continue with stocking stitch and 1 edge stitch in garter stitch in each side. When the piece measures 30-32-34-31-33-35 cm start the lace pattern and the next row is worked as follows from the right side: 1 edge stitch in garter stitch, 1-4-7-6-6-10 stitches in stocking stitch, work A.1 until there are 2-5-8-7-7-11 stitches left on the row (= 7-7-7-8-9-9 repeats of 11 stitches), 1-4-7-6-6-10 stitches in stocking stitch and finish with 1 edge stitch in garter stitch. Continue this pattern. When the piece measures 48-50-52-54-56-58 cm cast off the middle 31-31-31-34-37-37 stitches for neck = 24-26-27-30-32-36 stitches left on each shoulder. The shoulders are finished separately. Continue the pattern as before. AT THE SAME TIME on the next row from the right side decrease 1 stitch for the neck – read DECREASE TIP-1 = 23-25-26-29-31-35 stitches left – NOTE: The stitches which do not fit into the pattern when decreasing are worked in stocking stitch (applies to XL, XXL and XXXL). Continue the pattern as before until the piece measures approx. 50-52-54-56-58-60 cm. Loosely cast off with knit from the right side. Work the other shoulder in the same way. Cast on 32-32-36-36-40-40 stitches with circular needle size 4.5 mm and Air. Purl 1 row (= wrong side). The next row is worked as follows from the right side: 1 edge stitch in garter stitch, * knit 2, purl 2 *, work from *-* until there are 3 stitches left on row, knit 2 and finish with 1 edge stitch in garter stitch. Continue this rib for 4 cm. Change to circular needle size 5.5 mm. On the next 2 rows increase as described below. First row worked as follows from the right side: 1 edge stitch in garter stitch, work 2 stitches in each stitch until there is 1 stitch left on row – read INCREASE TIP-1, finish with 1 edge stitch in garter stitch = 62-62-70-70-78-78 stitches. Next row is worked as follows from the wrong side: 1 edge stitch in garter stitch, purl until there is 1 stitch left on row and AT THE SAME TIME increase 17-17-9-20-12-12 stitches evenly over these stitches – read INCREASE TIP-2, finish with 1 edge stitch in garter stitch = 79-79-79-90-90-90 stitches. Work 2 rows stocking stitch without increasing, with 1 edge stitch in garter stitch in each side. Then work as follows from the right side: 1 edge stitch in garter stitch, work A.1 until there is 1 stitch left on row (= 7-7-7-8-8-8 repeats of 11 stitches), finish with 1 edge stitch in garter stitch. Continue this pattern until A.1 has been worked a total of 5 times in height. The piece measures approx. 31 cm from the cast-on edge in all sizes and there is approx. 23-23-23-21-20-18 cm left to finished length. 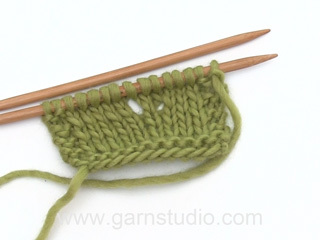 Continue with stocking stitch and 1 edge stitch in garter stitch in each side. 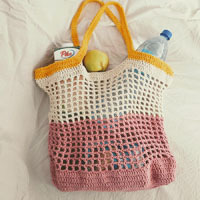 AT THE SAME TIME when the piece measures 32 cm in all sizes, decrease 3-3-3-4-4-4 stitches evenly – read DECREASE TIP-2. Decrease like this every 4th row a total of 3 times = 70-70-70-78-78-78 stitches on needle. Continue with stocking stitch without further decreases. When the piece measure 41 cm in all sizes, decrease 1 stitch in each side - read DECREASE TIP-3. Decrease like this every 1½-2-2-1-1-1 cm a total of 7-6-5-7-5-4 times = 56-58-60-64-68-70 stitches. Continue with stocking stitch without decreasing until the piece measures 53-53-51-49-47-45 cm (shorter measurements in larger sizes due to wider shoulders and longer sleeve cap). Insert 1 marker in each side; these show where the sleeves will be sewn to the armhole. Continue working until the piece measures 54-54-54-52-51-49 cm. Then loosely cast off with knit from the right side. Work the other sleeve in the same way. Sew shoulder seams inside the cast-off edge. Sew side seams from the armhole and down to split – sew in the outermost loop of the outermost stitch so that the seam is flat. Sew sleeve seams from the bottom up to the markers – sew in the outermost loop of the outermost stitch so that the seam is flat. Sew in sleeves inside the 1 edge stitch in each side on front and back pieces. The markers on the sleeves should match the bottom of the armhole. Knit up from the right side approx. 104 to 116 stitches around the neck (including the stitches from the thread in front) with short circular needle size 4.5 mm and Air – the number of stitches must be divisible by 4. Work rib in the round (= knit 2 / purl 2) for approx. 3-3½ cm. Loosely cast off with knit over knit and purl over purl. Er der ikke fejl i diagrammet kan ikke rigtig få det til at passe efter 4 pind det er på 5 pind der ikke rigtig passer. Hej Connie, Jo det skal passe, prøv at strikke en lille prøve over 11 masker med 2 rapporter i højden. God fornøjelse! Dear Mrs Lizet, patterns 200-14 and 201-23 are not published yet - you can find 202-8 in French and in English. Happy knitting! Ist die Maschenprobe wirklich richtig? Egal mit welcher Nadelstärke ich es versuche, ich lande mit 16 Maschen und 20 Reihen immer bei einer deutlich weiteren Breite als Höhe (z.B. Breite 12 cm, Höhe 10 cm). Bisher bin ich – zumindest mit Anpassen der Nadelstärke – immer auf die Werte der Maschenprobe gekommen. Hier leider überhaupt nicht. Liebe Suzanne, am besten versuchen Sie die richtige Breite zu bekommen, die Länge sollen Sie dann anpassen, die Höhe wird hier in cm gemessen. Hier lesen Sie mehr über die Maschenprobe. Viel Spaß beim stricken! Hoi! ik heb de eerste schouder van het voorpand af, maar vraag me af hoe ik nu met de 2e verder moet. Ik heb namelijk de steken op mijn naald, maar de bol garen zit nog vast aan de andere schouder. Je kan gewoon de draad af knippen en met de andere schouder beginnen door daar de draad aan te hechten. Beste Lezer,Ik wil graag een trui breien maar weet niet welke wol-garen het beste gebruikt kan worden gebruikt. ook het aantal bollen weet ik niet kunt u mij verder helpen als ik een foto upload?Kan dat een foto uploaden ? Graag hoor ik van u.
Das wär das erste Modell, das mir ins Auge gestochen ist. Richtig lässig. Ich hab schon lang nach dieser Ärmelform gesucht! Hallo, Unter dem Begriff Lieblingsmodelle habe ich mehrere Modelle abgespeichert, die ich nacharbeiten möchte. Jetzt finde ich diese nicht mehr. Liebe Frau Kitzler, die Favoriten kommen bald zurück! Danke für Ihr Verständnis; Viel Spaß beim stricken! J'aime beaucoup ce modèle et sa couleur jaune éclatante ainsi que son point fantaisie. Je voulais le mettre dans mes favoris, mais je ne trouve plus la rubrique "mes préférés"! Elle a disparue!! C'est vraiment dommage, je pouvais sélectionner les ouvrages qui me plaisaient.